I was a man of my time - a doting father, a devout Jew, a diligent worker, a patriot, or so I believed. But I was destined to be a man for all Time, an immortal. Who is the man the soldiers are dragging, father asked the youngster. But theyre calling him a king, father. So did I, when I came across this obscure prophet on his way to martyrdom  an encounter that would mold my destiny, force me to question my beliefs, and uproot me from all that I cared for. More than 20 centuries after my birth, I have decided to chronicle my life into a diary  or as I call it, a seculary  of my long haunting existence. Youll come to know why. Through these journals you are invited to accompany me on an epic journey of an envied, ageless man. An ostracized man, persecuted as the living proof of the divinity of a messiah in whom I never believed. In these pages you will meet some of the protagonists of the age, the ideals and the morality of the times, and learn the real truth behind events that would forever change the fabric of civilization, the very essence of what we are today. 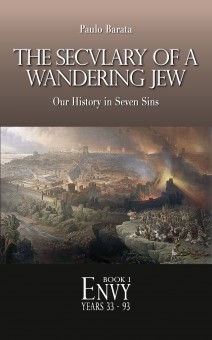 In the grand tradition of historical fictional biographies by Robert Graves (I, Claudius), Marguerite Yourcenar (Memories of Hadrian) and Gore Vidal (Julian), THE SECULARY OF A WANDERING JEW - ENVY, brings to light the story of an outsider fated to roam through the ages under the shadows of History.